Background: A current limitation in utilizing the stomach as a primary point of access for NOTES is the availability and reliability of the closure devices. The majority of devices described in recent reports are at an investigative or prototype only stage. Here we describe a reliable closure technique using readily available on-shelf endoscopic tools with a modified “clip-and-loop” closure in a porcine model. Methods: Animals were placed under general anesthesia in a supine position. First, a Seldinger technique was used to endoscopically place a guidewire in the anterior stomach. Two transfascial sutures were then percutaneously passed into the stomach on either side of the guidewire using a laparoscopic suture-passer. Their tails were tagged loosely and left extra-corporally. The gastrotomy was then created adjacent to the guidewire using needle knife cautery and a dilating balloon to facilitate passage of the endoscope. A brief peritoneoscopy was performed, and the endoscope was returned into the stomach. Tension was then applied to the transfascial sutures which tented the gastrotomy against the anterior abdominal wall to improve gastric insufflation. Next, endoscopic clips (Quick-clip, Olympus Inc.) were placed in pairs opposite each other at the edges of the gastrotomy. Then finally, using an endoscopic loop (Poly-Loop, Olympus, Inc.), the individual pairs were encircled and cinched together closing the gastrotomy in a zipper-like fashion. Transfascial sutures were removed at the completion, and an upper gastrointestinal fluoroscopy was performed to confirm seal. Repeat fluoroscopy was performed on days 2 and 7 post-operatively. Gastric burst tests were performed on post-operative day 14 at necropsy. Results: Ten animals were studied and survived for 14 days. Mean procedure times were 02:20 (minutes:seconds) for placement of the pre-gastrotomy transfacial sutures and 16:53 for the closure (n=9). One procedure time was lost due to technical malfunction in recording. Two sets of pairs (4 clips and 2 endoscopic-loops) were required for closure in all but the first animal which took 3. Thirteen clips were lost secondary to misfire with 7 attributed to the first animal when developing the technique. Fluoroscopy imagings were negative for all animals. Necropsy results revealed no abscesses, though gastrotomy site granulomas (n=3) and adhesions (n=1) were sporadically found. Bursting pressures ranged from 32-108 mmHg with a mean of 81.7 mmHg. Conclusion: A modified clip-and-loop closure using endoscopic loops to zipper clips together provided a simple and efficient closure in this animal model. The utilization of temporary transfascial sutures certainly enhanced insufflation ability, and thus provided an improved working environment for the closure. 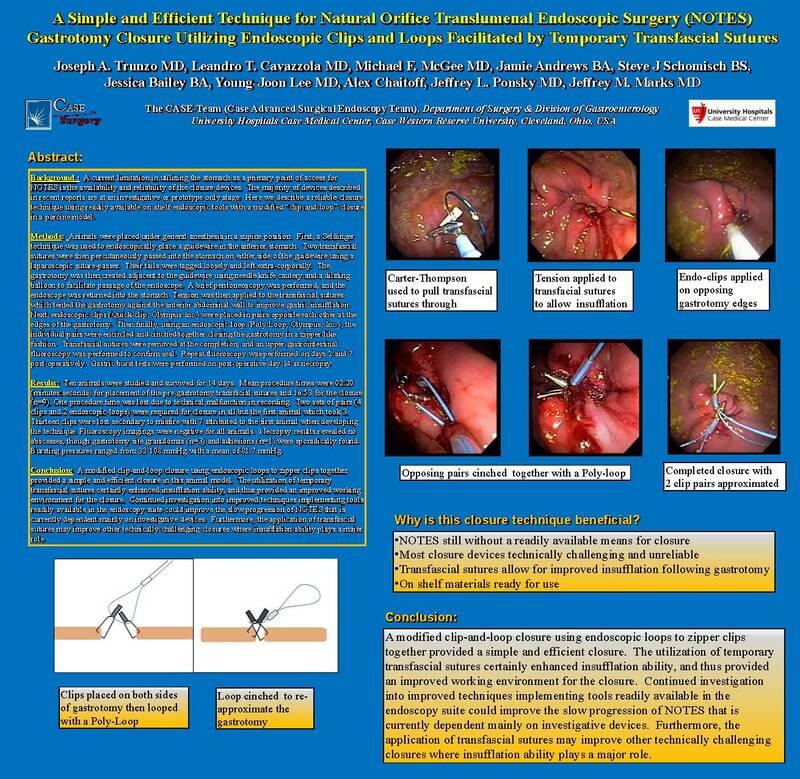 Continued investigation into improved techniques implementing tools readily available in the endoscopy suite could improve the slow progression of NOTES that is currently dependent mainly on investigative devices. Furthermore, the application of transfascial sutures may improve other technically challenging closures where insufflation ability plays a major role.